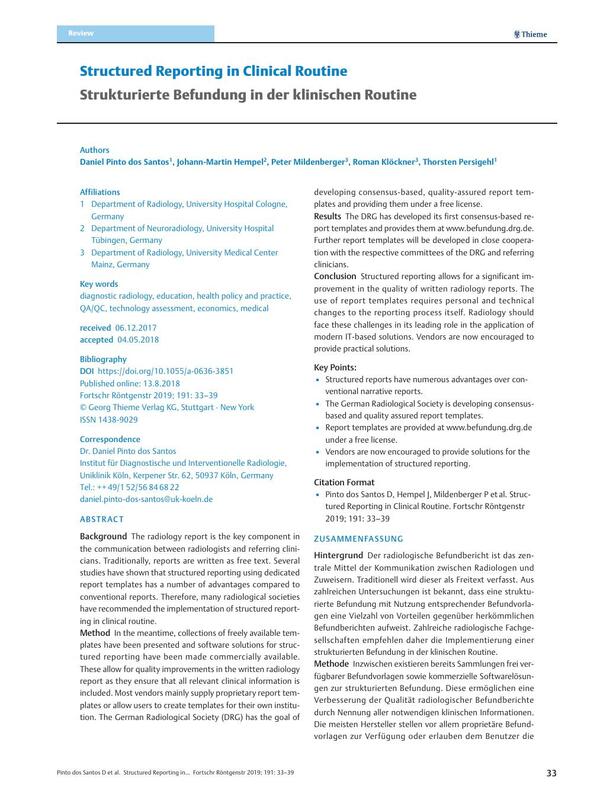 Background The radiology report is the key component in the communication between radiologists and referring clinicians. Traditionally, reports are written as free text. Several studies have shown that structured reporting using dedicated report templates has a number of advantages compared to conventional reports. Therefore, many radiological societies have recommended the implementation of structured reporting in clinical routine. Method In the meantime, collections of freely available templates have been presented and software solutions for structured reporting have been made commercially available. These allow for quality improvements in the written radiology report as they ensure that all relevant clinical information is included. Most vendors mainly supply proprietary report templates or allow users to create templates for their own institution. The German Radiological Society (DRG) has the goal of developing consensus-based, quality-assured report templates and providing them under a free license. Results The DRG has developed its first consensus-based report templates and provides them at www.befundung.drg.de. Further report templates will be developed in close cooperation with the respective committees of the DRG and referring clinicians. Conclusion Structured reporting allows for a significant improvement in the quality of written radiology reports. The use of report templates requires personal and technical changes to the reporting process itself. Radiology should face these challenges in its leading role in the application of modern IT-based solutions. Vendors are now encouraged to provide practical solutions. Structured reports have numerous advantages over conventional narrative reports. The German Radiological Society is developing consensus-based and quality assured report templates. Report templates are provided at www.befundung.drg.de under a free license. Vendors are now encouraged to provide solutions for the implementation of structured reporting.